We compiled a bunch of questions people have about learning how to kiteboard and voila, this page came to life. Scroll down the page until you find a match to the questions you have about learning how to kiteboard. The best way to learn kiteboarding is to start with a trainer kite. Here's a quick review of what we believe are the TOP 3 Trainer Kites to begin learning how to kiteboard. Kiteboarding? Kitesurfing? What's the difference? Kiteboarding is the ultimate water sport! The speed of water-skiing, the tricks of wakeboarding, the carving turns of surfing, the quiet freedom of sailing, all combined with jumping and flying all roll together into one exciting sport. Some call it kiteboarding, others call it kite-surfing. Although the two terms are often used interchangeably... the name "kiteboarding" is more commonly used in the US. In Europe and South America most people call it "kitesurf". NE Brazilians that do their kiting in the waves call it Kite-wave. When they say it, it sounds like "Kite-chi-wavey"
The first time I held onto a one of those monster kites, in 1999, I was instantly hooked, and that was only standing on the beach! Holding onto the power of a kite that big, while watching it float 90 feet above my head was all it took to get addicted to the feeling. Kiteboarding has all the ingredients to maximize the fun-factor. The kite easily folds up small enough to fit into a back-pack. a control bar with lines completes the set up. Ride in light or strong winds, flat water or waves. Insane aerial maneuvers, caving on the wave face, or just cruising the flats. Add a relatively short learning curve, and it adds up to "Huge Fun"!!! 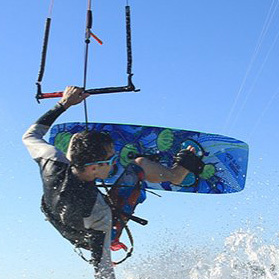 Kiteboarding can be done in all types of water areas providing the wind isn't blocked. Most kiteboarders ride in the ocean, or bays. Others kite on large lakes or rivers. Looks like fun but... I don't live near the water? Whether you live far from the water. or just prefer to keep dry, you can kite on the grass, dirt, sand, or snow. Kiting with a mountainboard is called "kite-landboarding" or kiting with a snowboard or skis... "snow-kiting"
The options are only limited by your imagination: skateboard, ice skates, 3-wheeled buggy, or even roller blades. The short answer is 10mph and up, although more wind is more fun. When you see the photos of people doing big floaty jumps, they are generally kiting in moderate winds of 15mph or more. Yes.. it's possible to kite in less than 10mph ( 8-9 mph or so ) but it requires more skills and can be frustrating. Once the wind gets to steady 12mph, life is good! The steadier the wind the better. Is Kiteboarding Dangerous? Why is it considered an Extreme Sport? YES. It's true, kiteboarding "can" be extreme and dangerous. And, at the same time, if approached with respect, the risks can be minimal. Kites large enough to pull you across the water, also have enough power to pull you up vertically. When a kite is held in a steady position in the sky, it's like revving a motorcycle with its clutch pulled in. Docile. Things change when you steer a kite aggressively from one position to another. The amount of power generated can be enormous. Doing the same thing with a large kite in strong winds is much like revving a big 1000cc bike, and then popping the clutch. One second its docile, the next, ferocious. Anytime you connect yourself to the power of a large kite, you will want to be properly trained. Begin with a trainer kite and master your basic kite skills before moving up to a larger, more powerful kite. Take a lesson, and then get some gear that has current safety features. Learn how it all works, and think before you fly. Helmet / Head protection. If you can read this, you likely have something valuable up there. The total price depends on the type of kite, size, brand, year, type, etc. $1720 - $2530 is a realistic price for a complete kiteboarding package with newer gear. A smaller kite costs less than a larger kite, reducing the package price. Can I find a package for less? Maybe... but it's not very realistic to spend much less than $1700 on a complete package, unless you're a feather weight, or riding to an area with very strong winds in which you'll need a tiny kite. Or, unless you buy used gear. When you see a package advertised for less than $1700. you'll need to look very closely to figure out why. Many sites show a 5m kite in their package, but it's not until you select a 9m, or larger that you'll see your actual price. You may find it's easier to buy a kite w/ control bar at one place, and a board and harness somewhere else. In the right winds, you can ride any board with any kite. Yes, I've done it. : ) 18m kite with a 122cm twin-tip to a giant surfboard (or SUP) with a small 3-4m. Those are extreme examples, but they work. a long time, and as your skills improve and you test out other boards, you will likely find one that feels just right. Most people new to snow-kiting will already have a snow-board or skis, so you'll only need to buy a kite and harness. Apex is a great foil kite for those who are not interested in kiteboarding or kitesurfing. Apex kites run between $700 to $1200 including the control bar. Then you will need a harness which costs $170 to $230. Or, if you already have an inflatable kite from kiteboarding, great; then grab your snowboard, hook up and go. Your price will be very similar to a Landboarding package. You may not need to buy a board, but you'll likely be wanting a larger more powerful "sheetable kite". Kite-Landboarding is approximately half the price compared to gear packages for the water. $1300 minimum. Realistic price for a complete landboarding package. Me? Can "I" learn kiteboarding? "Can I do this? " Yes Yes, Yes, Yes, and Yes! Your age, weight, or past experiences are not important as long as you have the desire to learn, and willingness to follow our recommendations. All we can say is..."Welcome to the sport!" Lets get started! Way back in Sept of 2002, we conducted our first "girls kite clinic" in Cocoa Beach, FL. We covered it all: Theory, trainer kite flying on the beach, safety, body dragging, relaunching and even boat launching. Even though we had to deal with very light winds, it was a total success. All the girls were up and riding on the board. What about girls? The more the better! There are many ladies who kiteboard, and we would all love to see a lot more! :) In general, we've found that ladies learn faster than men! Sorry guys. Ladies are naturally more attentive, and cautious. They pay close attention to the words of their instructor and it shows. Where strength is lacking, a girl's skill and finesse can level the field. Ok, I'm sold! Where do I begin? How do I get started? The first part:"Kite", the second part "Boarding"
Get a trainer-kite, and then practice all of the exercises on the included DVD and our how-to page. Beginning with a trainer-kite is the smartest thing you can do if you are serious about learning to kiteboard. The same applies whether you want to learn to kite on snow, dirt, sand, or water. Learning kite skills is not difficult, but it does take some time until the basic movement becomes instinctive. Make mistakes while flying a "trainer-kite" and it's no problem. However, make the same mistake on a full size kite and you WILL pay the consequences! ...seriously underestimates the power a big kite can produce. We don't want you to bust a collar bone on your first day out. A bigger concern are unskilled kiters putting innocent spectators at risk. If you respect the sport, you will most likely have a good ride. Disrespect it, and your ride could be a world of hurt. Not good. We ALL lose if one accident gets our sport banned from a local beach. Yup... It's already happened in more than one location. Kiteboarding "can" be dangerous. One minute you're standing on the beach, and in the blink of an eye you can be lifted off the ground and spun into a tree. Take the time to learn and master the basic kite skills using a trainer kite. Later, take lessons and you'll be ripping it up in no time, going huge, and loving life! Save money on lessons. You'll learn faster and easier. Save money on repair bills. Make your mistakes on a trainer, not on more costly big kite. Save money on emergency room bills and broken bones. Save our sport from needless bans. Even though flying a trainer-kite can never "guarantee" safety, it can go a long way to help you better understand kites and make controlling your kite instinctive and thus help to prevent many mishaps. Do I need Board skills before learning to kiteboard? Yes. Learning board skills (or tuning-up your your current board-skills) prior to learning kite-boarding is a smart move, and will allow you to learn and progress faster. If you are planning to ride on the water, get out and practice wakeboarding behind a boat, waverunner, or at a "cable park". Wake-boarding practice is by far the best way to develop the needed board skills for kiteboarding. Any type of board skills are helpful: Surfing, snowboarding, skateboarding, skimboarding, or sailboarding (windsurfing). Still, wakeboarding practice is the best way to prepare your board skills. When wakeboarding, be sure to practice riding with your "other foot" in the forward position! We all have a dominant stance. Some of us are naturally more comfortable with the left foot forward (called "regular" footed), and others, like me, are more comfortable with their right foot forward (called "goofy" footed). When you kiteboard on the water, you will initially be spending 50% of the time riding with each foot in the forward position. When riding to your right, your right foot will be forward, and when riding to your left, your left foot will be forward. Yes... It's awkward in the beginning, thus giving even more incentive to practice your other stance before learning kiteboarding. For kite-landboarding... taking a lesson would be a good idea, but not a necessity if you begin with a small kite. For snow-kiting.. the slippery surface adds risk. You'll need to be confident with your ability to depower, release the kite, and self-arrest before your head meets a tree. Snow-kiting lessons are recommended. For kiteboarding (on the water), no way around it, you need to take lessons! Using any type of power kite can be dangerous, but when you add water, the rules change fast! Kiteboarding on the water is NOT just about balancing on the board. There is a lot to learn.. Right of Way Rules, +++++. There are many excellent brands on the market to choose from. If anyone ever tells you that a particular brand is the "ONLY brand to buy", just smile and say "ok.., thank you..bye." ANY BRAND that puts a smile on YOUR face is a good brand. At Kitemare, we don't care what brand you buy or even where you buy it! Seriously, as long as you're happy, we're happy and "sharing YOUR stoke!". After over 15 years in the kite business, and after considering: quality, price, performance, safety, warranty, and manufacturer support. we obviously have brands that we prefer over others. Is it better to buy new or used gear? Out of the thousands of trainers sold, it's difficult to find a used one for sale. Strange but true! It seems that everyone who has a trainer kite, wants to keep it. It depends. Sometimes you can find a friend that updates their kite quiver every season and then sells their old kites that are less than a year old and still in great condition. However, sometimes the price difference between a new and used kite is not enough to take any chances with gear than may not have been taken care of. Kiteboarding is still a young sport and with each new season the kites become more reliable, more stable, easier to relaunch and control, and most importantly.. safer. Don't short yourself of a great experience with faulty equipment. We think used boards can be a huge value. Boards are very durable and the older boards still work great. Harnesses generally last a long time as well. It depends on the price, your budget, and your personal preferences. If you buy a used board, just make sure it's the right fit for you. A board can make a huge difference in your success of learning this sport. Once again, don't cheat yourself of a great experience. When I started wakeboarding, I had a hard time getting up and staying up. The board made a night and day difference. This sport is a progression sport, so buy equipment that will grow with you. Most kite brands offer a 6 month or 12 month warranty against manufacturer defect. In our 15+ years in the kite business, we've seen valid warranty claims with ALL brands. It's a small percentage, but it can happen. I recently saw an online store stating that they "never had a warranty claim on an HQ kite" Two possibilities... either they're lying through their their teeth, or two, they don't sell a large number of kites. HQ does make excellent kites, but be realistic: .5 to 1% warranty (+/-) claims happen with almost every product in the world. In our view, ALL of the major kite brands (North, Naish, Best, Core, HQ, Ozone, Cabrinha, etc) are making really great kites and some of the newer smaller brands are just as good or better than the big names. Warranty is one reason we are huge "Best Kiteboarding" fans! Best Kiteboarding provides an excellent product at a quality price with a warranty that is the best in the industry: Lifetime fair and reasonable warranty. If you like quality, service, and performance, they are one of the best. In most cases, improper use is the main cause of issues. Line breaks mainly happen from snagging your line(s) and then tugging on the line to release it. Doing so will chafe and weaken your lines. If your lines get snagged, walk over and gently release the snag with your hand. Blown seams or torn fabric mainly happens from your kite coming in contact with sharp objects, and/or power-slams. Give yourself a buffer zone when flying your kite. Stay far away from trees, fences, cars, sign-posts, or similar objects. If you ever have your kite speed toward the ground, you can either steer it away, or simply "release" your control bar to release most of its power and speed. I'm a Wakeboarder, Snowboarder, Surfer, Skateboarder ... Why bother with a kite? Kiteboarding is a natural extension of other popular water sports. Wanna rip... without a boat? Wanna boost big jumps that exceed what you can even do with a giant pylon and a "double-up"? For the price of one ski boat, you can buy kiteboarding gear for yourself and 20 of your friends! Gasoline is expensive but the wind is free! The wake skills you've acquired already make you "1/2" a kiteboarder. Get a trainer kite, take a short lesson... and prepare for lift off. Tired of sitting on the beach waiting for more wind? That was me, windsurfing since 1983 and only really having fun when the wind was 20 knots or more. Even on those days, the wind and wave angles rarely aligned to produce decent conditions for big jumps or wave riding. Windsurfers proudly wore those "Life begins at 40 knots" t-shirts. And the gear.... 2 masts, 4 sails, 2 booms, boom bra, mast feet, mast extensions, battens, a fin quiver, slalom board, wave board, and a light wind board. WAY... too much gear, and a major hassle and expense to travel with. Now consider 2 kites and one board, ripping in 12-15 knots, and big jumps... on FLAT water, total 360 degree visibility and great "up-wind-ability". After 17 years of windsurfing I sold all my gear! Ok, I'll admit, I'd still like to catch a session or two on a windsurfer, just for the sensation of a forward loop. On a windsurfer it's work just to chop-hop a couple of feet. In the very same conditions, kiteboarders are boosting 10-20 feet of air! Kiteboarding is not windsurfing. The board skills are very different. Windsurfers ride with their board flat on the water while "loading the fin." When kiteboarding... you'll need to use your heel-side edge. The trimming of a sail is not the same as moving a kite to generate power. Get out and practice riding a wakeboard or snowboard to learn the needed board/edging skills. Practice with a trainer-kite just like everyone else. Do these 2 things and you'll gain a HUGE advantage when learning to kite! Wouldn't it be nice to ride without buying a lift ticket? Find a big open field or lake covered in snow, a bit of wind, a kite and go! On the mountain, you rely on gravity. With a kite, all you need is wind and snow. The options are endless. Go big on the flats, and even learn to use the kites power to snow-kite up-hill. Surfing is and has always been the "king of watersports", no argument there! How much time do you actually spend standing on your board "surfing" the wave compared to the time you spend paddling, duck-diving, waiting, and fighting for your position in the line-up? With a kite.. the action is endless! No paddling out. No endless waiting, or fighting for the peak. Just high speed ripping, boosting fat airs, and YES even down-the-line wave riding! Kite powered surfing allows you to easily position yourself in front of the lip, escape from a closeout, connect wave after wave, and fly back out to the line-up. A kite can turn a boring, mushy, blown-out day into an epic day pumped on an amazing rush of excitement. For sure, paddle out on glassy sessions, but when the wind gets strong.. it's time to grab your kite. No worries.... were not leaving you out! Mountain Boards (what kiters now call Landboards) with their 8" inflated tires, work great on hard packed sand, dirt, and grass. No need for hills or man made terrain; just an open field, or beach. Grab your board, add the power of a kite, and cruise, or fly, the option is yours. Which of these sounds better to you? Power-up > Hop on > Slide > Endless Ride! We are here to help you. That is our priority.